I was an indirect fan of Samurai Jack in high school. I kinda know what the theme song sounds like, and I remember a little bit of an episode with the Scotsman in it. But beyond that, I really can’t tell you much about the show. That being said, I always thought it was really cool. The animation was different and set it apart from other shows. It was a cartoon, but it was a little serious, and so you felt like you were a little more sophisticated if you knew about it. 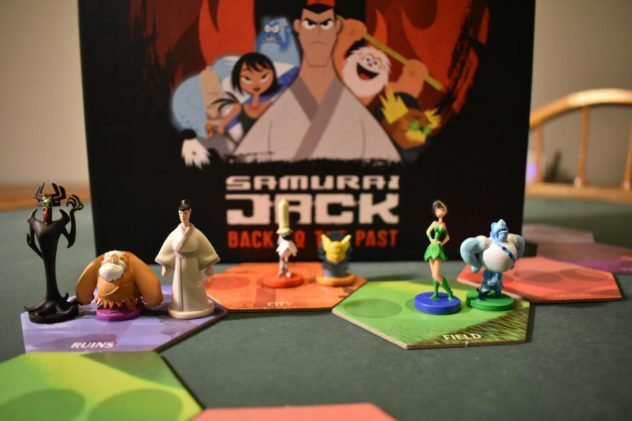 So I was excited to see Samurai Jack: Back to the Past announced by USAopoly a few months back, especially when I saw the awesome miniatures that were to be included. Now, after playing the game, I can say that it definitely has some good fan service, but not much to offer other gamers. Samurai Jack: Back to the Past aligns with the storyline of the final season of the show that released last year (which admittedly I did not watch). Samurai Jack is trying to get back to the time before his evil nemesis, Aku, began to rule. You are serving as one of Jack’s helpers – all characters from the show – and are working to keep Jack from going insane, while simultaneously trying to obtain the most honor by sticking close to Jack and more successfully defeating the enemies found at the end of each of the three rounds. This story found on the game box comes across as a card-based movement game on somewhat variable game boards. Each round begins with you setting up a path of tiles that represent the different locations you can visit. On each player’s turn, they secretly select a card that matches one of the locations, and when players reveal them simultaneously, they move to these locations. Landing in the same location as Jack earns you some bonuses, while sharing the same space as Aku punishes you and forces you to randomly move on your next turn. As you move from location to location, you’ll also be collecting Support cards that represent allies, traits, and weapons. These cards will be necessary to defeat the various enemies you will face at the end of the path. Some of these cards are character specific, giving you extra honor. If you’re unable to collect the types of support shown on the enemy’s card, then you won’t receive any honor at all at the end of the round. Once everyone has had a chance to battle the bad guy, you’ll reset the path, set up a new enemy, and start again, until you finally defeat Aku at the end of the third round. At that point, the player with the most honor wins! There is a ton of fan service in this game. The miniatures are high quality and could be put on display on a shelf if you wanted. You’ll also find great artwork on the cards and other game components, all of which reflect the style of the show. Each of the Support cards also features an element from the show, and while I don’t really know what they’re talking about most of the time, I’m sure fans will get a kick out of what they see. While the game is competitive, there is a small cooperative element that puts a twist on the gameplay. Jack moves randomly each turn before the players decide where they will go. Once everyone has gone, if Jack finds himself alone or in the same location as Aku, he will move forward on the Insanity track. Get too far, and everyone loses! This mechanic forces players to keep an eye on Jack and not just seek their own gain, because if everyone plays that way, then everyone will lose. I mentioned that the game is easy to learn, and much of that simplicity lies in the lack of depth to the rules of the game. Sure, you get to choose how you move, and there is some strategy as to when you try to lead the pack or bring up the rear (the person that is in last gets to move first the next round, but they also select Support cards last). However, Jack and Aku both move randomly, so even if you have a good plan, the randomness of the cards can mess with you. As we were playing, we never really felt like we could plan much beyond the current turn. And heaven forbid you land on the same space as Aku, since you will now have your moves determined by the same random deck of cards used by Jack and Aku. I ended up having no decisions to make for three turns in a row once because I kept getting placed in the same locations as Aku. Not really all that fun, if I do say so myself. The randomness and small amount of input from players lead to Back to the Past often feeling like it’s playing itself. 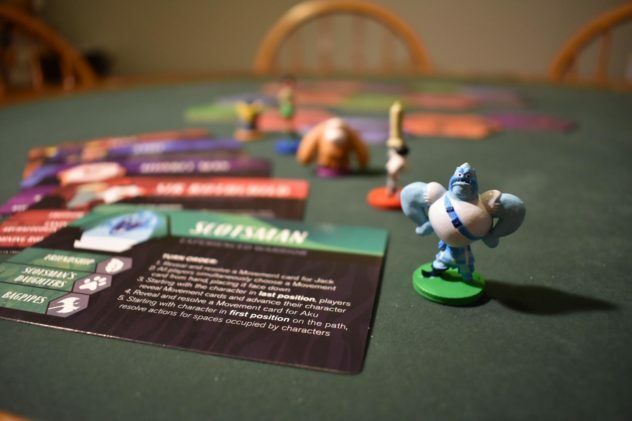 When players don’t have the Support cards they need at the end of a round to defeat the boss, the blame often goes to the game and not the player. It’s possible that the types of Support cards needed weren’t dealt at the beginning of the round, or perhaps Aku kept landing on inopportune spaces. Most of the satisfaction in gaming comes from developing and executing a plan. You’re not really able to do that in this game, which makes it feel like the licensed property board games that we were accustomed to decades ago with just a slightly different feel. Given the simplicity of the mechanics and the lack of player impact on the game, it seems that this game was made for kids. But that confuses me a little, as I feel like this is a property that most kids don’t really know about or wouldn’t understand. Sure, it had a season that came out recently on Cartoon Network, but I think most Samurai Jack fans are my age. And given my experiences with the game, I don’t know how many of those fans would come back for more of the game after their first or second playthrough. I want to like this game, and I appreciate that USAopoly brought this property to the table. 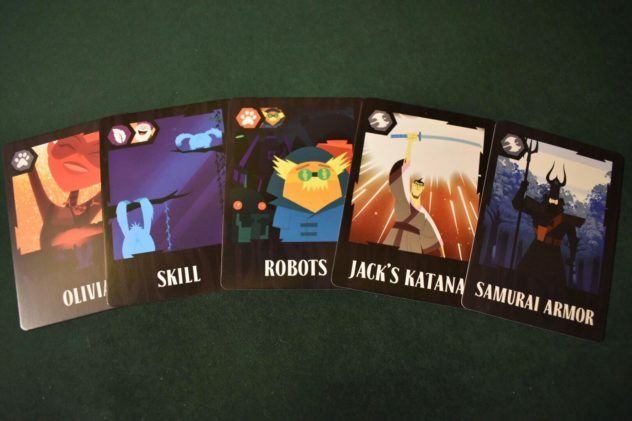 If you’re a huge Samurai Jack fan, you’ll love all of the artwork and the 3D models, and the game box will look great alongside any other memorabilia. You may even enjoy getting to take on the role of some of the supporting characters (though perhaps disappointed you don’t get to play as Jack himself). I also think that any young fans of the game will really enjoy it, especially those that don’t do a lot of other gaming. For everyone else, though, it’s hard for me to recommend that you go out and pick up this game, even if it’s on sale. There’s just not enough in the experience to keep you engaged, and by the second round you’ll be looking for the game to end. So maybe we do need to help Jack get back to the past, because that seems to be where he – and this game – belong. You can pick up Samurai Jack: Back to the Past on Amazon or ThinkGeek.